Welcome to the Commander Helpdesk! The purpose of this thread is for you to have a general place to post and discuss this particular subforum and its rules and structure. It's also the perfect place to post feedback or suggestions about anything relating to the Commander sub. Feedback on staff fun threads such as the Top 50 List, or ongoing thread like the Ban List. 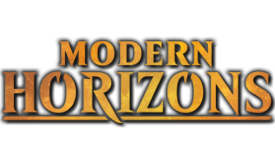 Additionally, when the Rules thread is updated or there is another major announcement, we (the moderators) will post about the changes in this thread, and feel free to comment on those. However, this thread is not for complaining about a warning you've received and disagree with - if you want to appeal a warning, please contact the relevant Moderator as outlined in this announcement. This thread will not be heavily moderated, but as always, keep your posts civil and on topic. what about drunk commander talk? I may be just a tad inebriated. Probably best left for Off-Topic and even there you should think about what you are saying, as we've had some drunk ramblings there in the past which were probably better left unsaid. What if we do a "what deck should I buy/get into" thread? It might help clog the threads less, but I'm not sure if it will work because EDH doesn't really have a metagame, unlike Modern, Standard, Legacy, and Vintage. If people want to ask questions, they're probably better off making their own thread, getting an answer, and letting the discussion on that deck eventually dwindle down normally. If a lot of people ask the same question at the same time, it might all get merged together in order to save space/clutter, as they'll at least be temporally related. If you (or any individual) want to make a general resource/primer-esque type of thread listing major archetypes, popular color combinations/generals (per scoeri's stats? 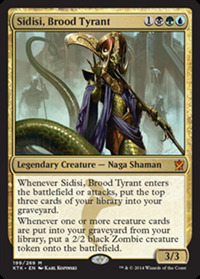 ), and correlate that to which pre-con deck to buy and which cards to replace to get started... I have no objection to that kind of thread being made. Is there a particular problem you feel like that typr of thread would solve? Are you seeing a lot of "what should I buy" threads/replies? We used to have a "what commander should I play next" thread but we retired it because we had like 5 people asking for help for every one response we got it seemed by the end of it. Without creating a new thread for those kind of topics we seem to just funnel requests into a place where we can ignore them so it made more sense not to do that because we were just throwing the help requests into an abyss. I just thought that it would be easier to organize, but ISB already mentioned the problems. Making a primer on "how to get EDH" is an interesting idea, but I'm not the best at making primers, considering I JUST got back into Magic a month ago after a year break. I've been looking around, but I can't seem to find what the MCD and SCD thread prefixes mean. Maybe a rules thread I missed? I've been looking around, but I can't seem to find wha the MCD and SCD thread prefixes mean. Maybe a rules thread I missed? We'll double check our documentation to make sure it's there, or more evident, but they stand for Single Card Discussion, and Multi Card Discussion. SCD is usually used to discuss a specific card, or a card and its functional reprints, such as Fleshbag Marauder and Merciless Executioner may both fit under the same SCD. MCD is typically for a class of cards, such as perhaps for discussiong the various Gravepact options, or even perhaps more vaguely to discuss black control cards... In short, discussing multiple cards, that share a common thread of discussion that you are looking for. 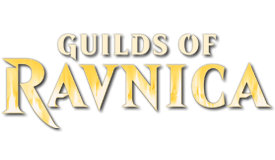 1) The Commander Forum is please to welcome Jivanmukta to our staff. 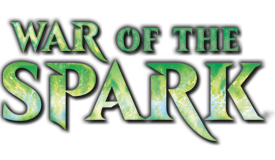 As a long-time contributor to the Commander forum (and especially Duel Commander) as well as around the site we felt that will bring a new viewpoint for us and help the forum become more inclusive of Duel Commander. 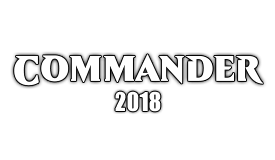 2) Going hand in hand with Duel Commander, we are pleased to announce our new Duel Commander Forum. You may have noticed a slight change to the subforums. Essentially, with the exception of name changes and reordering, everything is the same about the existing subforums. 1v1 has split in half to accommodate both Duel Commander and 1v1 play using the traditional (multiplayer) ban list. Moving all the threads over will be a process, so please bear with us and give us patience while we make the change (and don't forget to update any hotlinks you may have). If you see or have a thread that needs moving, you can report it using the "Wrong Forum" option, or PM one of the Commander Mods. Thanks for everyone's support during our growth and continued feedback. Any chance you can direct me to the place where I can make a LFM New Orleans, LA Area commander thread? We have a Looking for Group thread but I couldn't find anyone already located there listed yet. Thanks for the help! Yeah, I've visited and discussed commander playgroups with every store I know of within 20 miles, but most are only interested in standard, modern, or another tournament format. I'm just looking to start a playgroup. Thanks again for the help! You can try to post to the Looking for Group page as well just to leave a contact for PMs as well. Its always possible that someone in the future tries to find you looking for a group as well. I can verify that his works, though it may not happen quickly. I've had a couple people contact me and meet up because of that thread now. We have added [Casual] as a new thread tag. 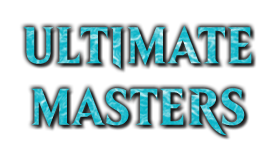 All users have access to this prefix, and it can be used to identify both decklists and discussions as a partner to the existing [Competitive] tag. Just curious if we would be okay to have a custom card for EDH thread? I don't know if you'd want a subsection for that or not even want it in the commander area at all. 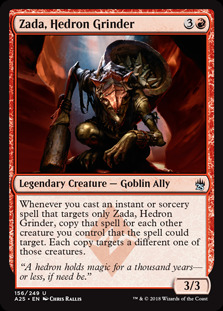 Im curious as I normally would just use the Custom Card thread but often times I want EDH players' eyes on the card as that is what I would be using them in. This isn't an urgent thing but I was just curious what you guys thought on this. The short of it is that CCC within Commander is something we discuss from time to time. Overall, we feel like it doesn't really belong here (we have a forum dedicated to it after all), and many times the cards presented turn into a slew of "here's why your card is broken/bad" comments. 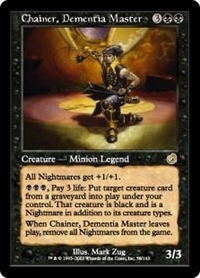 Often it seems that cards are made simply because it is some dream card a person wants for their deck, and with no thought of balance or actually making the card. It is also something that is difficult to contain to a specific thread (you probably have seen this with the topic coming up in Off-Topic, Unreleased Card Discussion, and random threads). It isn't a subject that we flat reject, simply one that every time it comes up and we start discussing the merits, the simplest solution is usually "ship it to CCC". Hello, if I was to post a challenge edh for people to make, where would I post it? I am trying to get better at making decks. I have had trouble creating more competitive decks as I only really build with the cards I have. I dont have that many value cards, in function or expense. I (almost) never play at FNM type events so its not like im playing against $2k decks. If I do usally play at one, Its a draft or limited game. Any advice on building decks is greatly supported! DMs are appreciated. To put it more simply, it's like saying, "I can prove Jesus is real and loves you. See? Here's my Hispanic friend Jesus. He's had a crush on you for a long time. Tell em' Jesus." Here's a joke! Whats the internal temperature of a Taun-Taun? That's a bit vague for me to give you a definitive answer, but probably the main forum would be ok. Can you give us a few more details, or PM us with some specifics? That'll help us get you squared away more easily. 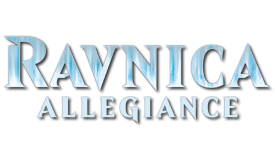 My idea is to post a challenge of creating a 100c singleton deck, not necessarily edh, with many of the key cards of the storyline of ravnica.So, like all of the gates, Maze´s End a few of the guild leaders, and so on. So, a theme deck challenge? I guess if it was a community building thing, the main area would be fine. 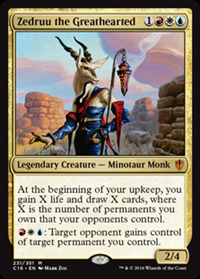 Random thought: Have you guys thought about having a Commander Specific rules section as there are often very specific rules that people ask about that are only relevant to our community. I just see so many rules questions pop up on the forums that I don't know if it would be worth making a Commander Rules Question thread. Just curious on y'alls thoughts on it.